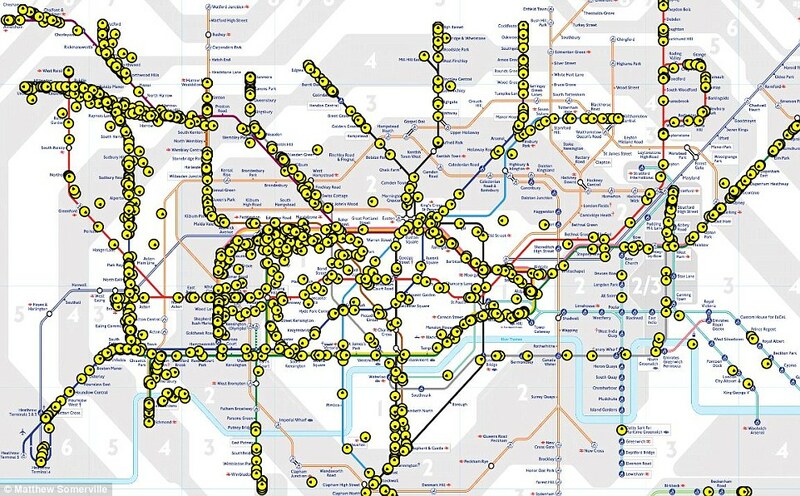 The mind-boggling busyness of the London Underground has been revealed in a fascinating interactive map that shows the exact location of every train on the network at any given moment. It has been created by web developer Matthew Somerville, who came up with the idea after Transport for London (TfL) removed restrictions on commercial use of its travel data. And as a bonus, if you click on each one, information about when it’s due at the next station - and where it’s ultimately heading - appears. Viewers who watch it for a while will notice that the site occasionally behaves rather erratically with trains taking odd detours or suddenly speeding up or slowing down. The IT wizard has also produced a ‘vaguely live map of trains’ and a ‘split ticket finder’ that works out if you can save money by buying multiple tickets for a journey. Another web creative, Bruno Imbrizi, who lives in East London, has also conjured up a map (below) that shows Underground trains in real time – but his can be spun around in 3D.It's perhaps not quite as useful, but is no less mesmerising. He said: ‘I heard about the TfL prediction service and decided to do something with it. ‘The initial idea was to make an audio experiment with a note playing every time a train would arrive at a station. But the service returns the time with precision of 30 seconds, so the experiment wouldn't be very musical.